A transgenic animal is one whose genome has been altered by the transfer of a gene or genes from another species or breed. The photo shows two transgenic mice positioned either side of a plain mouse. 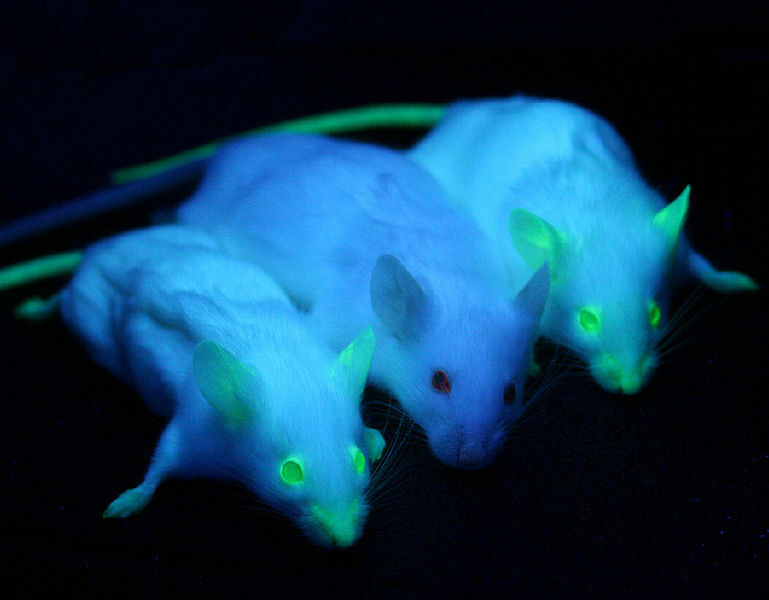 The transgenic mice have been genetically modified so that they carry a green fluorescent protein which glows green under blue light. Credit: Ingrid Moen et alet al., BMC Cancer, 12/21 (2012), 1-10. Transgenic animals are routinely used in the laboratory as models in biomedical research. Over 95 per cent of those used are genetically modified rodents, predominantly mice. They are important tools for researching human disease, being used to understand gene function in the context of disease susceptibility, progression and to determine responses to a therapeutic intervention. Mice have also been genetically modified to naturally produce human antibodies for use as therapeutics. Seven out of the eleven monoclonal antibody drugs approved by the FDA between 2006 and 2011 were derived from transgenic mice. Transgenic farm animals are also being explored as a means to produce large quantities of complex human proteins for the treatment of human disease. Such therapeutic proteins are currently produced in mammalian cell-based reactors, but this production process is expensive. In 2008, for example, the building of a new cell-based manufacturing facility for one therapeutic protein was estimated to cost over US$500 million. A cheaper option would be to develop a means to produce recombinant proteins in the milk, blood or eggs of transgenic animals. Progress in this area, however, has been slow to-date. Only two biomedical products have so far received regulatory approval. The first is human antithrombin III, a therapeutic protein produced in the milk of transgenic goats, which is used to prevent clots in patients with hereditary antithrombin deficiency receiving surgery or undergoing childbirth. A relatively small herd of goats (about 80) can supply enough human antithrombin III for all of Europe. The second product is a recombinant human C12 esterase inhibitior produced in the milk of transgenic rabbits. This is used to treat hereditary angiodema, a rare genetic disorder which causes blood vessels in the blood to expand and cause skin swellings. The ability to produce transgenic animals is reliant on a number of components. One of the first things needed to generate transgenic animals is the ability to transfer embryos. The first successful transfer of embryos was achieved by Walter Heape in Angora rabbits in 1891. Another important component is the ability to manipulate the embryo. In vitro manipulation of embryos in mice was first reported in the 1940s using a culture system. What is also vital is the ability to manipulate eggs. This was made possible through the efforts of Ralph Brinster, attached to the University of Pennsylvania, who in 1963 devised a reliable system to culture eggs, and that of Teh Ping Lin, based at the California School of Medicine, who in 1966 outlined a technique to micro-inject fertilised mouse eggs which enabled the accurate insertion of foreign DNA. The first genetic modification of animals was reported in 1974 by the virologist Rudolph Jaenisch, then at the Salk Institute, and the mouse embryologist Beatrice Mintz at Fox Chase Cancer Center. They demonstrated the feasibility of modifying genes in mice by injecting the SV40 virus into early-stage mouse embryos. The resulting mice carried the modified gene in all their tissues. In 1976, Jaenisch reported that the Moloney Murine Leukemia Virus could also be passed on to offspring by infecting an embryo. Four years later, in 1980, Jon Gordon and George Scango together with Frank Ruddle, announced the birth of a mouse born with genetic material they had inserted into newly fertilised mouse eggs. By 1981 other scientists had reported the successful implantation of foreign DNA into mice, thereby altering the genetic makeup of the animals. This included Mintz with Tim Stewart and Erwin Wagner at the Fox Chase Cancer Center in Philadelphia; Brinster and Richard Palmiter at the University of Washington, Seattle; and Frank Costantini and Elizabeth Lacy at Oxford University. Such work laid the basis for the creation of transgenic mice genetically modified to inherit particular forms of cancer. These mice were generated as a laboratory tool to better understand the onset and progression of cancer. The advantage of such mice is that they provide a model which closely mimics the human body. The mice not only provide a means to gain greater insight into cancer but also to test experimental drugs. Transgenic animals are animals (most commonly mice) that have had a foreign gene deliberately inserted into their genome. Such animals are most commonly created by the microinjection of DNA into the pronuclei of a fertilised egg which is subsequently implanted into the oviduct of a pseudopregnant surrogate mother. This results in the recipient animal giving birth to genetically modified offspring. The progeny are then bred with other transgenic offspring to establish a transgenic line. Transgenic animals can also be created by inserting DNA into embryonic stem cells which are then micro-injected into an embryo which has developed for five or six days after fertilisation, or infecting an embryo with viruses that carry a DNA of interest. This final method is commonly used to manipulate a single gene, in most cases this involves removing or 'knocking out' a target gene. The end result is what is known as a ‘knockout’ animal. Since the mid-1980s transgenic mice have become a key model for investigating disease. Mice are the model of choice not only because there is extensive analysis of its completed genome sequence, but its genome is similar to the human. Moreover, physiologic and behavioural tests performed on mice can be extrapolated directly to human disease. Robust and sophisticated techniques are also easily available for the generic manipulation of mouse cells and embryos. Another advantage of mice is the fact that they have a short reproduction cycle. Other transgenic species, such as pig, sheep and rats are also used, but their use in pharmaceutical research has so far been limited due to technical constraints. Recent technological advances, however, are laying the foundation for wider adoption of the transgenic rat. Transgenic rodents play a number of critical roles in drug discovery and development. Importantly, they enable scientists to study the function of specific genes at the level of the whole organism which has enhanced the study of physiology and disease biology and facilitated the identification of new drug targets. Due to their similarity in physiology and gene function between humans and rodents, transgenic rodents can be developed to mimic human disease. Indeed, an array of transgenic mice models have been produced for this purpose. Mice are being used as models, for example, to study obesity, heart disease, diabetes, arthritis, substance abuse, anxiety, ageing, Alzheimer's disease and Parkinson's disease. They are also used to study different forms of cancer. In addition, transgenic pigs are being investigated as a source of organs for transplants, which if proven clinically safe could overcome some of the severe donor organ shortages. The development of transgenic animals has recently been transformed by the emergence of the new gene editing tool CRISPR which greatly reduced the number of steps involved in the creation of transgenic animals, making the whole process much faster and less costly. This section on transgenic mice was jointly written by Lara Marks and Dmitriy Myelnikov. For more information see D. Myelnikov, 'Transforming mice: technique and communication in the making of transgenic animals, 1974-1988', unpublished PhD, Cambridge University, 2015. Technique published using fine glass micropipettes to inject DNA directly into the nuclei of cultured mammalian cells. High efficiency of the method enables investigators to generate transgenic mice containing random insertions of exogenous DNA.